Animalphabet is the latest book by Julia Donaldson, illustrated by Sharon King-Chai. This beautifully illustrated book has an animal for each letter of the alphabet. Bestselling author Julia Donaldson is well known for her fabulous book The Gruffalo. Animalphabet is Julia Donaldson’s latest release and another fantastic book for children. Especially perfect for those aged 3 to 5 years, Animalphabet is a lovely hardback book. You can buy it on Amazon here. As we explored the animal world with this gorgeous book we learnt a lot! With peep-through pages and fold out flaps this glorious gift for animal lovers becomes an interactive guessing game. Find out who is faster than a Caterpillar, who can hug tighter than a nightingale and who can fly better than a pig! With stunningly eye-catching artwork throughout, the Animalphabet book contains an exotic array of animals. They truly are stunnnig and something to marvel over. This is a book to treasure and stand proudly on display. Julia Donaldsons rhythmic words make the book flow beautifully making it lovely to read out loud. With each page we discovered an amazing collection of beautifully coloured animals in their habitats. Comparing animals to each other to learn comparison words and adjectives makes learning fun. Finding out who is bigger, smaller etc makes it such an enjoyable read. Izzy loves guessing which animal is next as we ask each question. We absolutely adore this stunning book, Animalphabet is fun to read with it’s rhythmic words and gorgeous artwork. Being such an interactive book makes it such a fun reading experience and would make such a lovely gift! We would definitely recommend the Animalphabet book for young animal lovers. We love children’s books, don’t forget to check our our Book Review page to discover more Children’s books we’ve reviewed. Have you heard of Animalphabet? Eva read One Snowy Night, a children’s collection of winter-warmer animal tales by best-loved authors. Illustrated by Alison Edgson, this paperback is aimed at 5-8 years and published by Stripes. A cosy collection of short winter animal stories perfect for bedtime reading. Beautifully and highly illustrated by Alison Edgson makes the book interesting even for younger children. One Snowy night is a charming collection of stories from authors Holly Webb, Jeanne Willis, Linda Chapman, Swapna Haddow, Leila Rasheed and Micheal Broad. Along with Liss Norton, Cand Gourley, Katy Cannon and Sita Brahmachari. Together, these fabulous authors and illustrator have created a gorgeous book for children. What’s not to love about a book full of heart-warming winter stories by many much-loved authors. One snowy night begins with a girl who ventures off in search of the secretive snow leopards in mountainous Mongolia. Discovering a baby snow leopard leads to a big discovery. This short but heart-warming story is a lovely winter read. A heart-warming tale of a young girl desperate to nicely wrap a present for her parents. Written by well-known and loved author Holly Webb, this story shows the true meaning of Christmas. When Lucy’s mischievous kitten Star is making it difficult to wrap the presents she gets grumpy with Star. At bedtime, everyone suddenly realises Star is missing! Lucy gets upset, realising Christmas isn’t Christmas without her loveable mischievous kitten. These cute winter animal stories make a perfect gift for animal lovers or young readers. With a total of 10 stories, this is a great read throughout December as a family. Do you love Winter Animal stories too? Midnight Fright is the latest Vlad The World’s Worst Vampire series for children aged 7-9 years. Written by Anna Wilson and illustrated by Kathryn Durst, Midnight Fright is available on Amazon for £5.99. Stripes sent Eva a copy to review, just in time for Halloween too! We’ve read and loved every Vlad book we’ve read so far and couldn’t wait to see what he’s got up to this time. 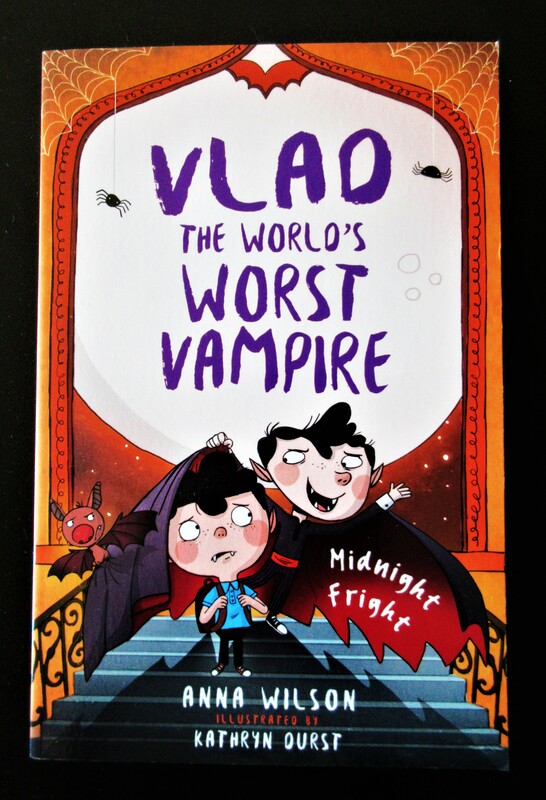 Full of adventure and hysterical yet relatable moments, Vlad proves he really is the world’s worst vampire! Vlad’s vampire cousin Lupus comes to stay, to teach Vlad how to be a proper vampire. Lupus can fly brilliantly, turn into a bat in the blink of an eye and has an annoying raven called Claw. All Vlad can think about is how to stop Lupus following him to Human school. Lupus charms all the humans, leaving Vlad in despair! Until the school play auditions which shows who really has talent, and who is the one with true friends, Vlad is in for surprise! The Vlad the World’s Worst Vampire series is really fun to read! Vlad is funny, he is always doing things that vampires wouldn’t normally do like go to school with humans! Midnight Fright is all about Lupus, Vlad’s cousin who teaches Vlad to be a better vampire. He teaches Vlad to help him get his bat license. Lupus is a bit of a show-off but in the end, he really helps Vlad to practise for his bat license. I love the illustrations in the book, they make the story really fun to read. If you love a good vampire story the Vlad the World’s Worst Vampire series is excellent. Perfect for reading over Halloween too! Does Midnight Fright sound like a book for you/your child?